Rev. Matthew Beers has been the pastor of Grace Rocky Hill since early 2016. Pastor Matt studied at Yale Divinity School and the Lutheran Theological Seminary at Gettysburg. 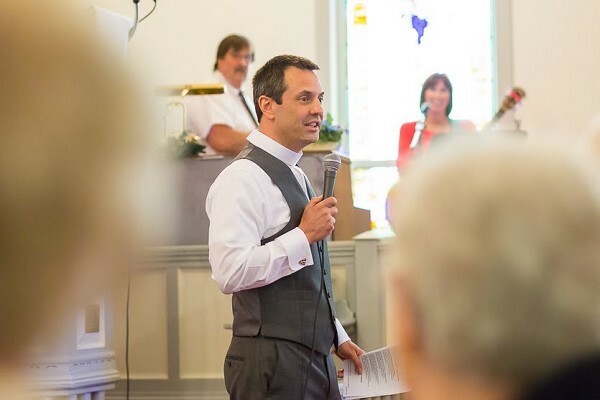 During his training, Pastor Matt worked as a chaplain at the Hershey Medical Center in Pennsylvania, where he received advanced training in clinical pastoral care. Pastor Matt has also been recognized by the University of Notre Dame for his application of spiritual care assessment tools in hospital settings. Before becoming a pastor, he worked at a community based psychiatric rehabilitation facility, where he served individuals with severe and chronic mental illnesses. While there, Pastor Matt led a spirituality class, and advocated for the spiritual care needs of those he served. Pastor Matt lives with his wife and daughter in Frederick County. He is an avid cyclist, fan of baseball, rarely misses a football game, and has been known to play in a band or two by strumming on his guitar.